Do you have snow? If you do you must try painting on snow. 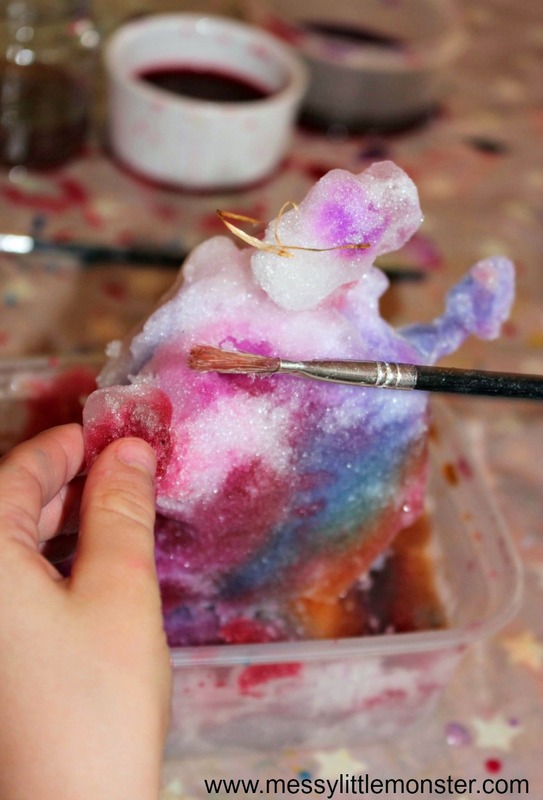 It is such a fun winter art activity for children young and old to enjoy. 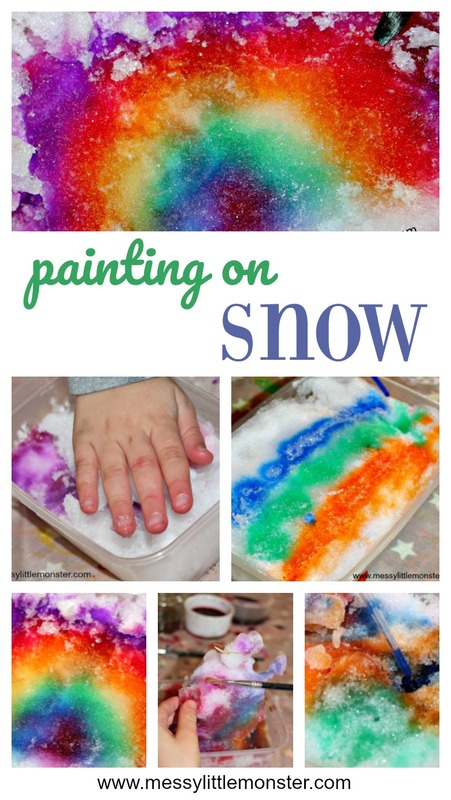 Snow paint it so easy to make too! 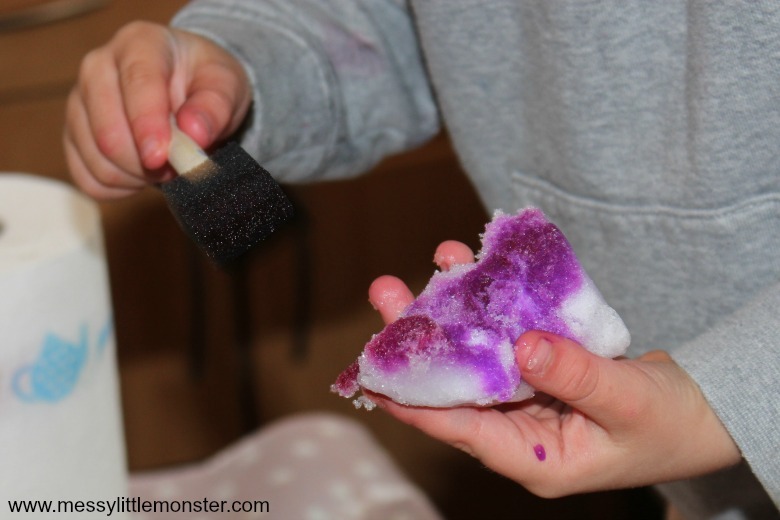 Whether you decide to paint directly on the snow outside or bring it inside where it is a bit warmer, the kids will love experimenting with painting different colours and patterns on the snow. 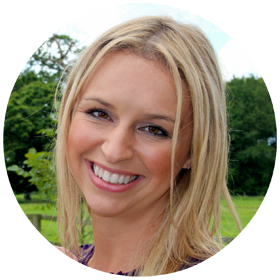 We haven't had snow for about 4 years, ( unless you count the tiny sprinkling of snow that we had last year), so the children were so excited when the snow started to settle on the ground last week. Up until now they have had to make do with making puffy paint melted snowmen and playing in fake snow, so you can imagine how excited they were. Harry and Daisy couldn't wait to get out in the snow to play on the sledge, throw snowballs and build snowmen, but they quickly became cold and wanted to come back inside. Making the most of having lots of snow we decided to bring some snow inside so we could paint it. We wanted to paint inside as the children were getting a bit chilly, but it would be great fun to use snow paint outside too. You could paint a snowman's face or work with others to create a huge picture or pattern using the snow as your canvas. 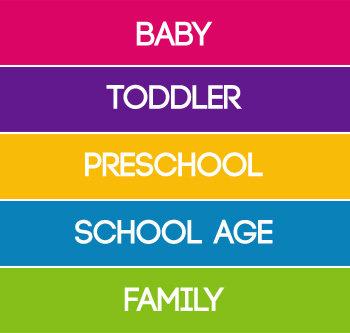 We are a participate in the Amazon Service LLC Associates Program, an affiliate advertising program designed to provide a means for us to earn fees by linking to Amazon and affiliates sites. 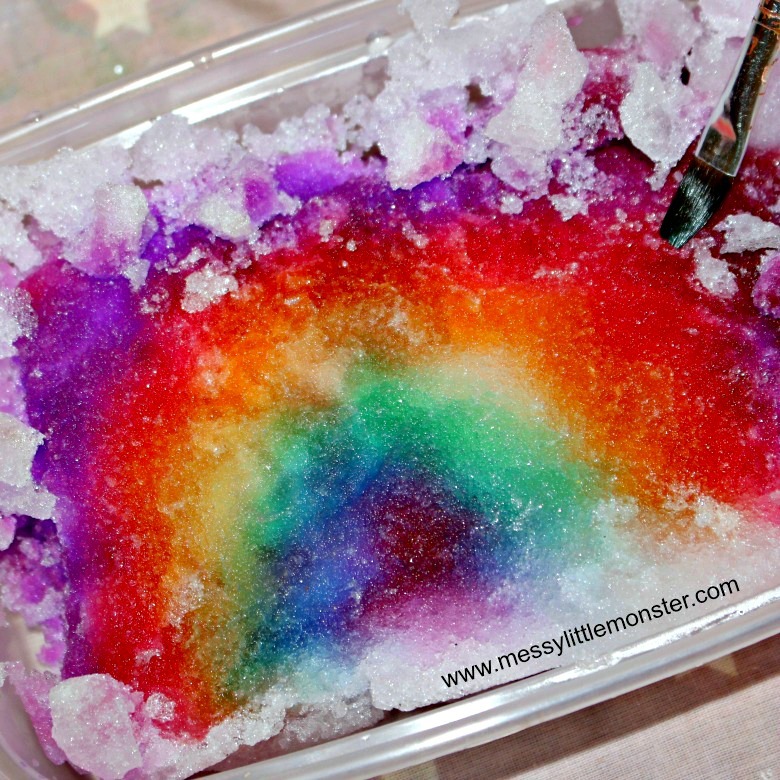 To make snow paint add a few drops of liquid watercolour into a small jar and then top the jar up with water. 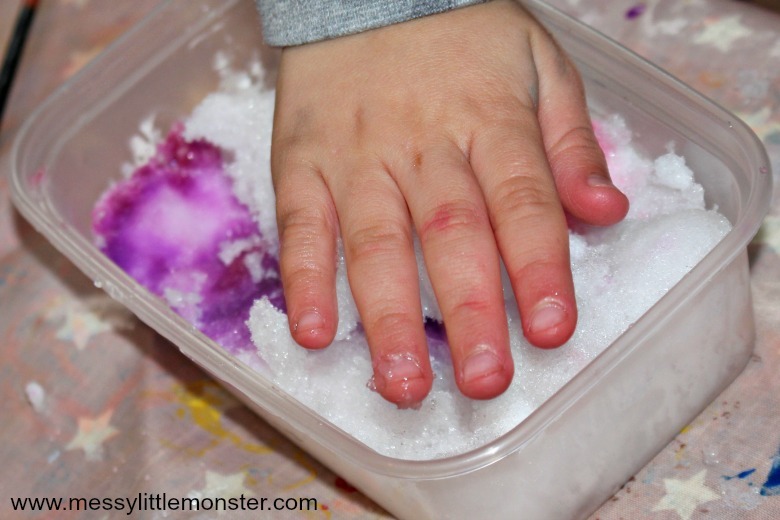 You need to make sure that you use really cold water so that the snow paint doesn't melt the snow too quickly. If the colour of the paint isn't bright enough add a few more drops of liquid watercolour. We collected some fresh snow from outside and used it to fill little plastic containers. This was a whole family activity which Harry turned into a competition (with several rounds so he and Daisy both got a chance to win!) We each had our own container full of snow to decorate in our own way. 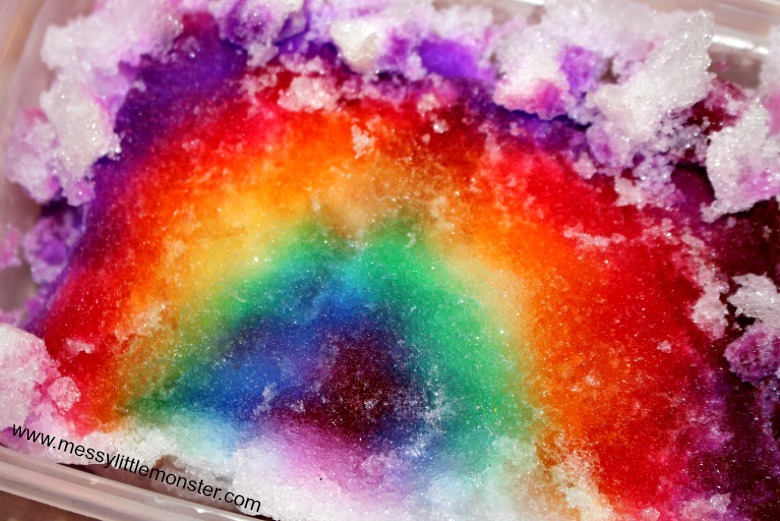 I decided to paint a rainbow on the snow using all the colours that we had available. I love how vivid the colours were and the way they slowly merged into each other as the paint spread across the snow. 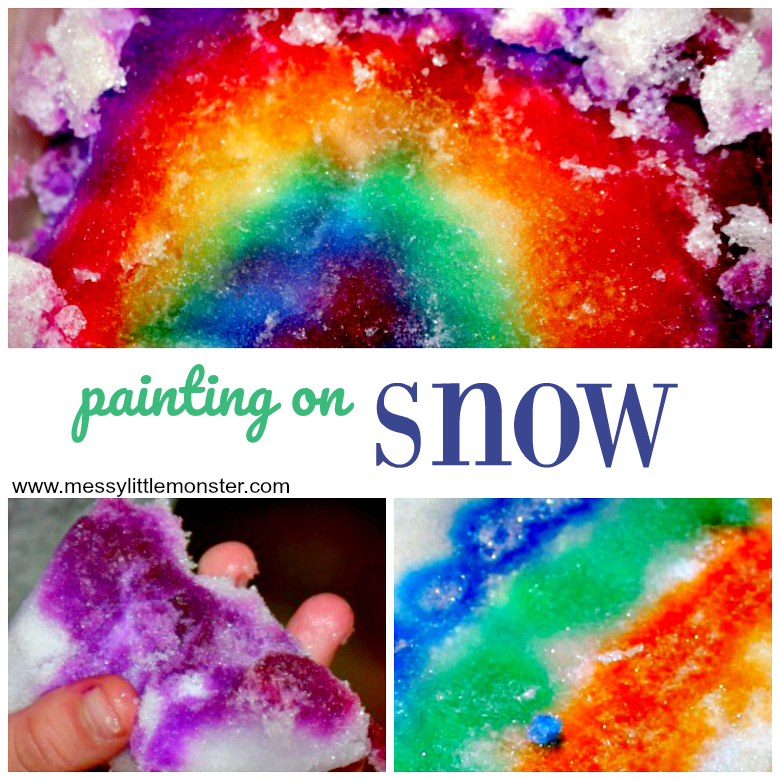 Once I had finished painting the rainbow I sprinkled a bit of extra snow on top. Harry (aged 6) painted his snow several different colours using a paintbrush. 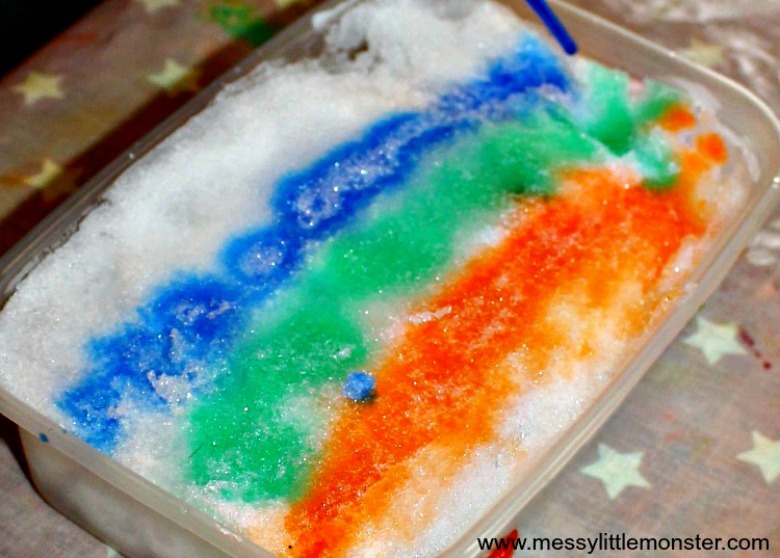 He used green, orange, blue and purple and he painted stripes across the snow. His painting looked very similar to his dads painting, I'm not sure who was inspired by who! 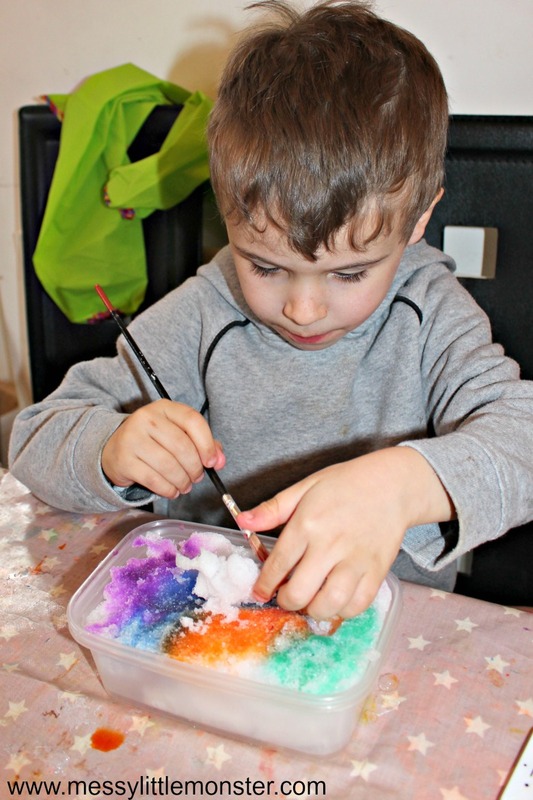 Harry enjoyed using the pipettes to add extra colour and to make holes in the snow. He collected some extra snow and he made a pokemon sculpture to sit on top of his snow painting. He spent so long carefully creating his sculpture to get it just right. After painting his pokemon he asked for a second container full of snow so that he could make another one. Daisy (aged 3) couldn't wait to get started and had already painted her snow orange before anybody else had sat down. 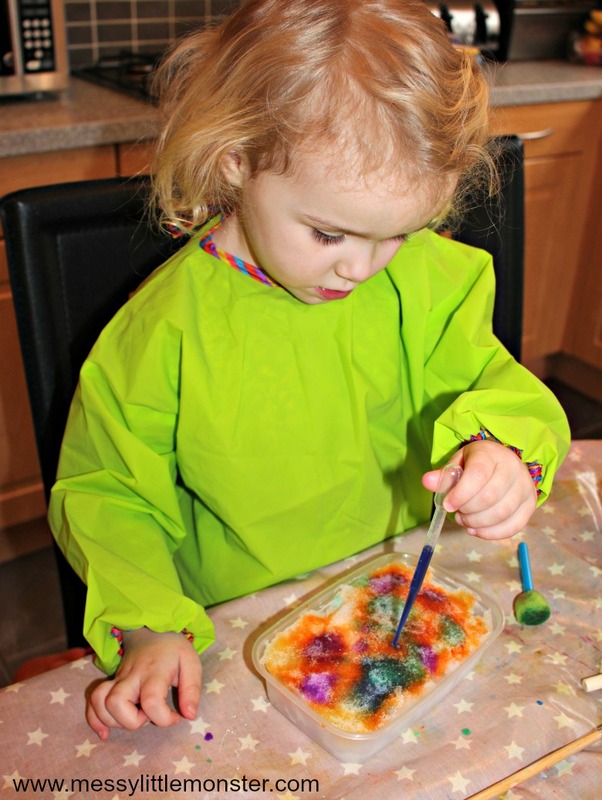 She used the pipettes to add other colours on top. We haven't used pipettes for a while so she loved having something new to use. Daisy loved adding more and more colours to see what happened as the colours mixed. 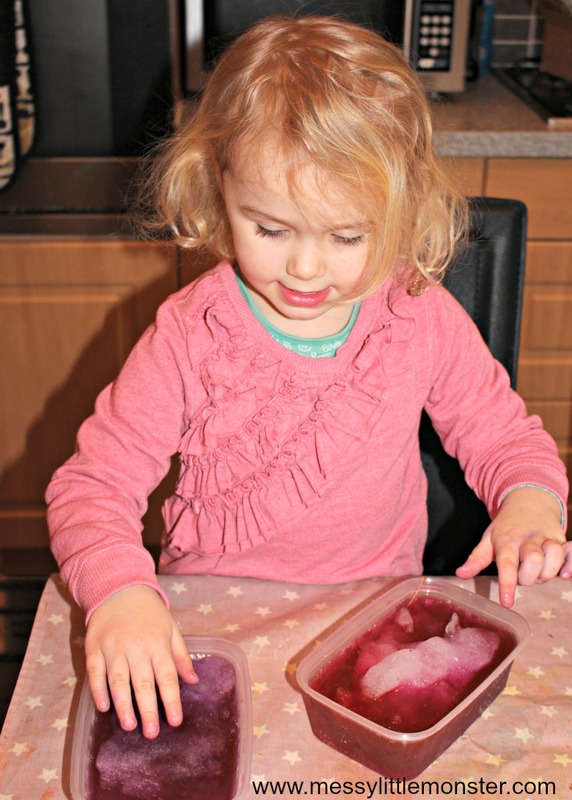 She was keen to make several different snow paintings and she enjoyed experimenting with different brushes and colours. Daisy wouldn't let me get rid of the snow art once we had finished and she loved seeing what happened to the snow as it started to melt. The snow here has all gone now, but we had so much fun with it. 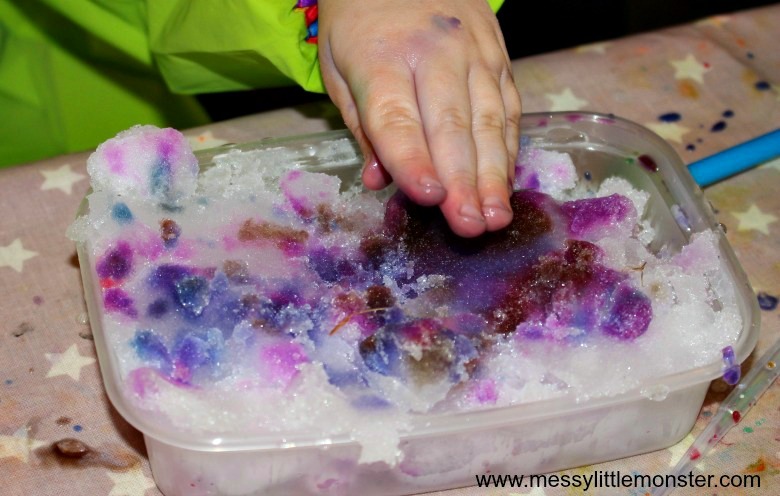 If you don't have any snow or you are looking for some snow themed activities to do while stuck inside on a snowy day, take a look at our collection of snow crafts and activities.